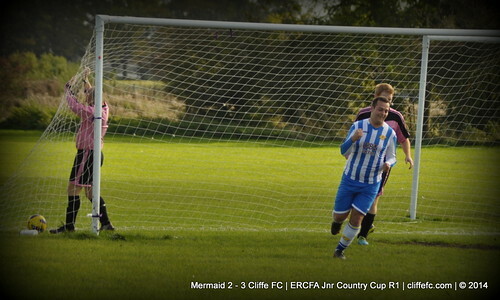 Cliffe FC progress to the next round of the County Cup with a 3-2 stoppage time victory over Bridlington-based Mermaid, Jack Dinnewell hitting the late winner. 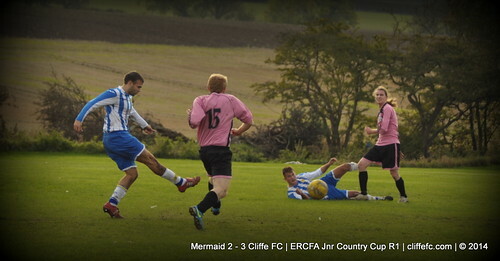 After a disjointed opening to the season, Cliffe FC had to make the long trip to Bridlington to face Mermaid. The venue for the tie had happy memories for Cliffe, having won there in 2009 and would eventually win again in 2014. Cliffe started bright and looked the better football through-out the tie, but struggled to keep their game at their highest level during the tie. Andy Edwards had an early chance blocked before it took a long range free-kick from Kev Taylor bounced over the ‘keeper, Tom Grundy getting a last touch to head the ball into the net to make it 1-0 to the away side. Cliffe looked to kick-on from this point as Darren Jackson in the middle of the park and the returning Chris Jackson up-front became a thorn in the home team’s side. However, Mermaid got themselves back in the tie, winning the ball back in their own half and then scoring a good goal to make it 1-1, it would be a fair assessment that this goal came against the run of play, 1-1 HT. With it level after 45 minutes it was felt Cliffe would eventually take the lead as the away side continued to create the most clear chances. In a similar fashion to Cliffe’s opener, Mermaid took the lead via a long ball not dealt with by goalkeeper, Dave Laverack in the Cliffe goal patted down a long ball only for hit to ricochet off Tom Hogg’s shin and into the bottom corner, 2-1. Cliffe were under pressure now to get back into the game and Nathan Parker brought Cliffe level, a decent finish past the ‘keeper, 2-2. There was plenty of time left in the 90-minutes and as the clock ticked down, Mermaid prepared for extra-time – making late substitutions in the final few minutes in preperation for the extra 30 minute period – Cliffe made their own changes and shifted Hogg up-front in an attempt to end the tie in normal time. Literally seconds later, Chris Jackson broke down the right wing squared it to Hogg who keeping the ball in centred it back to Jack Dinnewell who smashed the ball past ‘keeper and defender to break Mermaid hearts. Cliffe saw out the remaining couple minutes and progress with a 3-2 win. Next Saturday Cliffe FC return to League action and host Brooklyn FC, another test for Keith Tiplady’s men. Elsewhere, Cliffe FC Reserves returned to league action at York College against Hamilton Panthers Reserves – it wasn’t a happy return to league fixtures as they were handed a 7-1 drubbing. Somehow for all their dominance Hamilton still managed to find themselves down to 9-men, two red cards for dissent, after establishing a big lead. Joe White scored Cliffe’s consolation. Cliffe FC Reserves have a free week and due to scheduling, their next competitive fixture isn’t until first week of November.